The loading feeder shown in the top figure is used for transporting sheet metals in the automotive industry. With a cycle rate of maximum 28 [min-1] single sheets are raised by about 250 [mm] and set down after a horizontal carrying of up to 3 [m]. For a prototype, several cracks at the steel welded construction were observed. 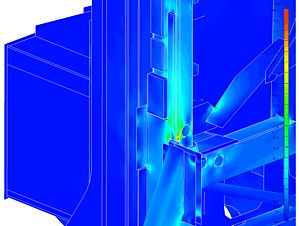 A static FE analysis considering the load due to the maximum accelerations could not explain these cracks. Operating vibration measurements showed that at the highest cycle rate the lowest vibration mode of the loading feeder is resonantly excited, resulting in vibration displacements of up to 4 [mm]. The natural frequency of the related mode shape is located at approx. 7.5 [Hz], which is far above the cycle rate. However, due to the strongly non-harmonic movement, this mode is effectively excited anyway. 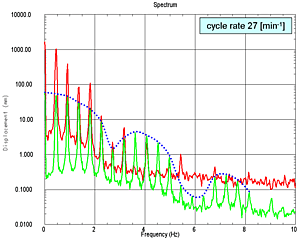 As an example, the mid figure shows an excitation spectrum obtained from the operating vibration measurements. In addition to the cycle rate at approx. 0.5 [Hz] a large number of harmonics are observed, especially for the vertical direction. Depending on the chosen displacement curve, sidelobes occur as indicated by the dotted curve. Considering this additional dynamic load the reason for the cracks can be explained. As an example, the bottom figure shows the dynamic stress distribution of a profile, which showed cracks in the prototype design. The FE analysis was used to develop redesign measures. 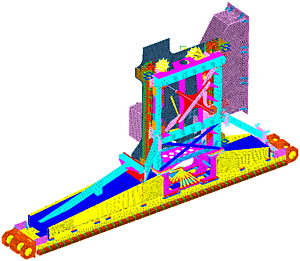 The loading feeder was globally stiffened in order to raise the lowest natural frequency. In addition, the local stress maxima were reduced by selective stiffening measures. Finally the driving profile was adjusted in order to avoid disturbing sidelobes in the excitation spectra.